About 30% of body's protein is collagen. 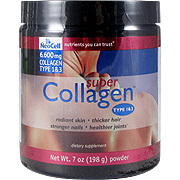 Collagen Type I is 90% of the body's total collagen supply. Both Collagen I & III are the main collagen types in connective tissue. As a dietary supplement, take three Super Collagen+C tablets twice daily on an empty stomach for maximum absorption. Collagen Powder contains 6.6g collagen protein only, no binders or Vitamin C. Hydrolyzed Collagen Protein derived from 100% pure pharmaceutical food grade bovine collagen. Ashley "This is a really great product"
I have been using it for a long time and it provides the perfect nutrients. Joanna "Perfect for beauty help"
This has really helped me with beauty. It has given me great benefits and the nails are a lot stronger. This has also helped my hair grow fast and my skin is really moisturized. Anonymous "i prefer the pill form"
Super Collagen Powder - is shipped in a discrete, unmarked package. Orders are processed immediately and usually take about 3 to 5 working days to be received. We do ask that you try it for 2 to 3 weeks to feel the full effects. Any information received is used only for order processing and shipping purposes. Your information, such as e-mail address, will never be disclosed to a third party.